Schools and universities have been promised a "significant" increase in spending, by the Chancellor Gordon Brown. The Chancellor's Budget speech pledged to "increase significantly the share of national income devoted to education over the course of this Parliament". But the details will not be known until the review of government spending to be announced in July. And there were no further details of whether the Chancellor was planning to fund a cut in teacher workload, scrap student tuition fees or to provide the extra money demanded by universities. But the Chancellor once again used his Budget to announce an additional capital payment to all schools for 2002 to 2003. Head teachers of typical secondary schools will receive a direct payment of �114,000, said the Chancellor. 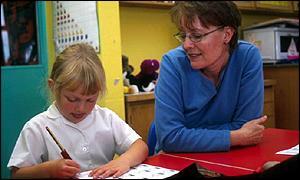 And a typical primary school head will receive �39,300. After the Budget announcements, the Education Secretary Estelle Morris announced that �87m of existing funds would be targeted at improving discipline in schools. This will be aimed at 33 "hot spot" areas in England - and will mean an increase in "learning support units" for disruptive pupils and more projects involving the police in schools. The National Union of Teachers welcomed the direct payments to schools, but said that the full picture would not be apparent until the funding settlement in July. "Without adequate funding, recruitment into the profession will continue to decline," said the union's general secretary Doug McAvoy. The pre-Budget statement, presented last autumn, indicated that education would not take centre-stage in this year's Budget. Instead the emphasis was on increasing funding for the National Health Service and reforming support for families. And instead the big questions of education funding have been deferred until the summer spending review. This will then determine how the student loans and fees system will be reformed. And universities are looking to the Chancellor to provide extra funding to provide places for 50% of young people by the end of the decade. Teachers' unions are also threatening industrial action if their workload is not reduced - and they too have been lobbying for a favourable settlement from the spending review.